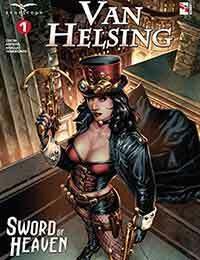 Van Helsing: Sword of Heaven Average 0.00/5 - out of 0 total votes. Is an ancient weapon feared by every undead creature a myth or a reality? Liesel is willing to risk everything, her life included, to get her hands on the legendary blade that could bring an end to vampirism the world over. Her quest takes her to a remote corner of India and beyond reality on an adventure that could bring her the vengeance she seeks if it doesnt drive her mad first.